L+M Development Partners is proud to introduce James Shell, the new superintendent for Kingsbridge Heights Apartments in the Bronx. James initially started working as a construction laborer on one of L+M’s Triborough Properties in Bronxchester about four years ago. He secured that position through the NYCHA Resident Economic Empowerment & Sustainability program, which focuses on fostering opportunities across employment, financial literacy, education, training and resident business development. While James was working in Bronxchester, the L+M staff noticed James’ diligence and recommended him for a position. 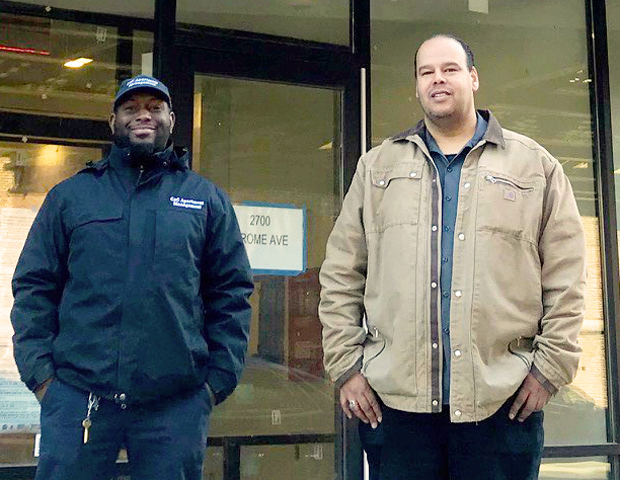 Jose Cruz, Director of Quality Control, who oversees hiring for the building maintenance teams, was equally impressed by James and immediately offered him a full-time position as a porter at Saratoga Square. At Saratoga Square, James was mentored by the maintenance team and completed boiler training and got certified in standpipe, fire alarm and sprinkler systems. His hard work paid off, and he was promoted to a handyperson position within a few months. Twelve months later, James was promoted again to his first superintendent position at 1428 5th Avenue, Harlem where he managed more than 120 units. During this period, Jose and James worked together to help sharpen James’ skills on topics like mechanics and overall building maintenance. When Jose was looking for a new superintendent for the brand-new Kingsbridge Heights Apartments late last year, James immediately stood out from the crowd. James happily accepted the position and now oversees more than 135 units in the Bronx. Congratulations James – we’re thrilled to have you as part of the team!